O Narayani, the Effulgent, the Three-eyed, the Refuge, the Auspicious, the Bestower of all wishes, the Blessedness that is in all that is blessed! Prostration be to Thee! On this auspicious occasion, brother Swami Saradaprabhanandaji, officials and devotees from the Durban headquarters join me in wishing every one of you a very happy Navaratri celebration! What is Navaratri? The word just means “Nine Nights”. The celebration of manifestation of Divine Mother in three forms for nine nights is called Navaratri. On these days we, Hindus worship Divine Mother in three aspects namely in the form of Mahaakaali, Mahaalakshmi and Mahaasaraswati. There is only ONE God which is the unifying force of Existence. This is called Shakti or Energy and when it is made understandable for the humans that Shakti is termed as Devi. She projects this Universe, sustains it and finally dissolves into Her and hence called the Divine Mother. Devi-worship or Shakti-worship is, therefore, worship of God’s glory, of God’s greatness, of God’s supremacy as manifested in this Universe. It is called ‘adoration of the Almighty”! Sri Ramakrishna, our Master performed the Mother Worship day in and day out and he realized in short span of his 50 years that She as Mother has pervaded everything. It is Her Will that alone makes this Universe grow, maintain and destroyed. Surrendering to Her all our actions and also the fruits of our actions is the way to gain peace and harmony in this world. Master used to sing a song with great devotion. It says that “tomaar kormo tumi koro maa, loke bole aami kori” You do your work, people say “I do”! Spiritual life is nothing but slowly effacing this ‘I’ and bringing an awareness of the Mother’s doing. When the feeling of “not I, but Thou’” comes in our core of our heart, we are, though living in the body yet liberated in this very life. Many of you are fasting, reciting Devi hymns, doing charity, observing other types of rituals too. Do whatever you do, do it as surrender to Her omnipotent Will. Please make the children learn Sri Durga Saptashloki during this holy time. May the Divine Mother who embodied for our sake in the form of Mother Sarada, energise all of us, awaken us to our spiritual worth and make us reach our goal of God realization is my earnest prayer! Thank you Maharaj for reminding us of Mother’s Glory! The sun is shining in all Her Glory and adding a sparkle to this brand new phase of navarathri. The beautiful weather reminded me of Swami Nischalanandaji’s meditation in the Prayer Book about the beauty of dew drops on the petals. The mental picture of mother nature creates a harmonious vibration. I spoke to Swami Premanandaji a few minutes ago. The mahatmas are on travelling to Cape Town presently. They are enjoying the garden route of South Africa. Swamiji conveys His blessings to Maharaj. Please accept my pranam and convey my pranam to self-effacing Revered Swami Saradaprabhanandaji Maharaj also. Glad to see your blog and in a short article you have explained beautifully the importance of Sri Sri Durga Puja and the glory of Divine Mother. Revered Swami Jagadatmanandaji used to tell us even before my joining the Order that the Divine Mother distributes “Krupa Packets” to sincere devotees during special occasions like Navarathri etc., and I strongly believe that. Even last night also he was mentioning about the need of special prayers to be offered during these days to get the special grace of the Divine Mother. Let us all pray intensely for the welfare of the world as well as for our own spiritual emancipation. I request you to kindly bless me also. P.S: We recently upgraded our website with the help of devotee-volunteers and it has come out very well. Please go through the same whenever time permits. Jai Sri Ramakrishna! Jai Durga Maa! It was heartening to learn about Revered Jagadatmanandaji maharaj’s keeping good health at his ripe old age. Please convey my respectful pranams to him. I cannot forget his coming to Ranchi Sanatorium and staying with us for a month or so. He chose to reside at the ‘Shantananda Kuthia’ that was fully refurbished just before his arrival. And how much joy he had and he spread the same to every one around him! For detailed description of the Navaratri festival here please refer to my blog where I have posted ‘A Summary’ of Devi Mahatmyam also, written by one of our devotees. Yes, I went through your newly upgraded Website! Its appearance is so serene and navigation was pretty easy. No problem I encountered in getting the photos etc. Add some clips of videos and the monks’ speeches is my suggestion! On this sacred festival, I offer my pronam to Maa Durga and the Holy Trio. and that’s why Sri Sri Matri Mandir, Jayrambati is so sacred to all of us. My pranam at the feet of Holy Trio and Maharaj. Your divine words bring much inspiration and guidance. We so often approach life with the attitude of doer. Master has however beautifully shown us that we must only offer unconditional love to the divine and all else is taken care of. After all she is Bhavatarini, Mother of the Universe who will liberate us all. 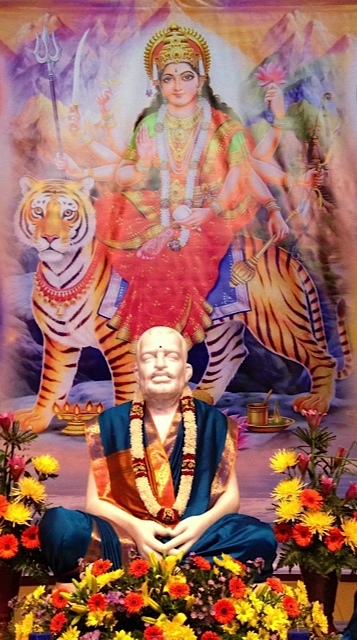 Shubh Navarathri Maharaj. May the grace of Holy Mother guide and protect you is my sincere prayer. Yes, you are right! All problems stem from the attitude of “I and Mine”. How we always jump about boasting about “my” achievements is charmingly explained by Master. He says that we are like potatoes, jumping in the pot. They become quiet when the fire underneath the pot is doused. Without the fire the potatoes can no more jump! Once this factual reality dawns in our mind we would be ‘straightened’! When will be decided by Her, Bhavatarini. Let Her Will be done! Kindly accept my humble Vijaya Pranam!. Kindly bless me to attain desirelessness. I always read your mail. It is really so much interesting, informative and full of joy and blissful. Kindly mail whenever you publish any article. Hope all brothers in Shillong are well. How was your Durga Puja there? I had seen the Puja long ago in 1982 when I heard from many devotees in Shillong at that time, that our ashram’s puja was the most satwik and the best in spiritually uplifting. Hope all of you have enjoyed such puja this year too. Thanks for your nice words! May Mother’s Will be done! We too at the PMB sub-centre were engulfed in Mother’s love! It was as if each devotee wanted to make Ma their very own, and with this type of attitude, the harmony and love that prevailed amongst us devotees was really wonderful. Actually every night after satsang, devotees wanted to remain in the shrine for long periods, not wanting to go to their homes, although it was quite late. Mother’s presence could seriously be felt! Maharaji, is it true that if one recites the Durga Saptashloki, it is like reciting the whole book of the Devi Mahatmyam? I humbly request Maharaji to clarify this point. It was indeed gratifying to learn about the pervasive harmony among the devotees at your place during this navaratri. So I was told by others also. I am reminded of the Tamil saying “anbe shivam” “Love is Shiva”. All our activities are expected to be laced with love and dedicated at the Lord’s feet. Then only peace can be attained. As you know Devi Mahatmyam consists of 700 mantras whereas Saptashloki has only 7 mantras. Both these are NOT equal in the recital but are capable to draw the same grace of Divine Mother. Sage Narayana had designed Saptashloki for people like those who have devotion in abundance but do not have enough time in their hands. The purpose of attaining Her blessings shall be fulfilled in the recital of any of these scriptures. As he saw in his vision, Lord Shiva requested Mother Parvati to “tell precisely a way” by which “success in every activity is obtained”. And the result is Saptashloki. All these seven mantras have been culled from Devi Mahatmyam only. It is like drinking juice of a fruit when one is unable to eat it! The result is same though not the eating pattern!! Here we have celebrated Navarathri with Golu and puja. Mr.Mani has returned from Sabarimalai on Navami day. As usual Kolkata celebrated Durga Puja in grand way. Our Shubo Vijaya Pranam to you. Trust this finds you all hale and hearty. Happy that Mani completed the Sabarimalai pilgrimage. Now the actual sadhana starts. Once the pilgrimage is done, one must sit quietly and ruminate the experience of going to Sabarimalai. Bhagawan Sri Ramakrishna compares this to a cow which after eating the grass sits in a place alone and munches what it had eaten! Visiting Godly places must make our minds filled with Godly thoughts. For about a year I’ve been making pilgrimage to this holy site where i encounter other devotees and much to contemplate. The photos posted of the Divine Mother recently are so beautiful and there’s so much to learn and from which to be inspired over and over again. Also, the worship of Sri Ramakrishna given in English is very much appreciated. Jai Ma! Jai Thakur! Jai Swamiji! Thanks indeed for your kind words! Welcome to this blog…this is an attempt to try conduct a sort of ‘Service’ among devotees called by many as eSatsang! This may not be regular as we do in our ashrams; neither there is a fixed congregation. This eSatsang is open to the entire world! Happy that you enjoyed the different articles posted here. Please convey our respectful pranams to Revered Swami Chetananandaji maharaj who had visited SA and has gained a special place in the hearts of devotees here. May the Divine Mother’s blessings be with you all is my prayer!